An article posted on the Green Belt Movement website described the late activist Wangari Muta Maathai as a Nobel Peace Laureate; an environmentalist; a scientist; a parliamentarian; a founder of the Green Belt Movement; an advocate for social justice, human rights, and democracy; an elder; and a peacemaker. Maathai lived and worked in Nairobi, Kenya. She died last September at age 71. I imagine that Maathai’s “autonomous” and “authentic” nature, norms and values enabled her to cultivate a deep sense of purpose and conviction for what she stood for—social equity and justice for all; respect for and conservation of the natural environment; peace; human rights; and democracy, among others. Her life’s work reflects an acceptance of responsibility for her role as steward and leader for the causes she so passionately championed even in the face of state-sponsored brutality and violence. Maathai was a leader of extraordinary character, vision, and integrity. Her disposition aligns with Kaptein and Wempe’s characterization of people with integrity by being in a state of “integral integration,” where words and deeds conform, and “external integration,” where social issues are acknowledged on a personal and global scale. Growing up in Kenya, I watched media reports concerning the public vilification and abuse Maathai endured from the regime of former Kenyan President Daniel Toroitich arap Moi. Many of us remember an extremely disturbing image of an assaulted Maathai after the police had brutally manhandled and evicted her and others from the site of a hunger strike that they were participating in, demanding the release of political prisoners. In this image, some of Maathai’s hair had been plucked out of her scalp and blood was dripping down her face. Maathai’s leadership and life work was continually affirmed in action—fearless action that places her at the top of the ranks of leaders with integrity and social responsibility. Maathai is a role model ethical leader that continues to deeply inspire me and many people across the world, encouraging us to do the best we can, which is best reflected in the story she often told about the humming bird. 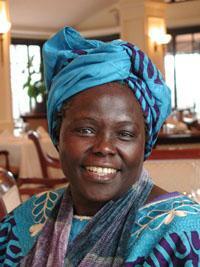 Rest in peace, Professor Wangari Maathai! We miss you.